If there was ever a game that didn’t fit into a single category, it’s Farm for your Life. Its premise is something like this: there’s been a zombie apocalypse and you’re one of the few survivors. They all need food and since you’re the one with the farm, you have to grow it. And you also have to cook it and serve it to them in an abandoned building. They trade you resources for the food though, which you’ll need to grow your “restaurant” and farm. 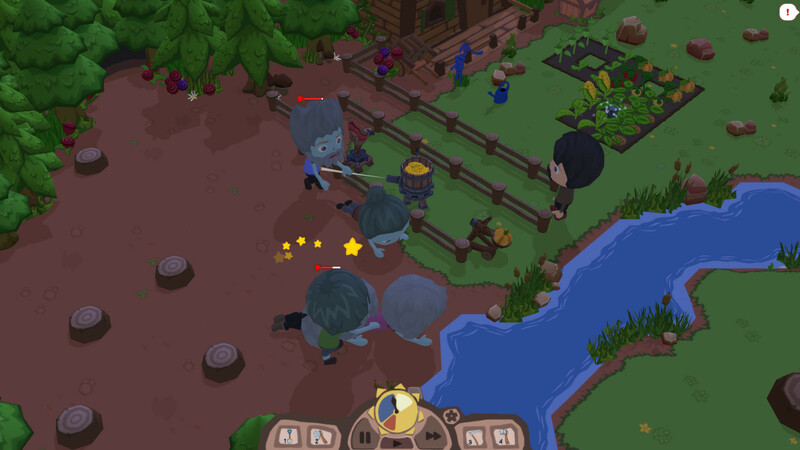 Oh, and the zombies invade (slowly) at night so you’ll need to pummel them with fruits and veggies and/or build mazes and machines to automate the job for you. So it’s this unholy union of farming sim, restaurant management, and tower defense in the guise of a bloodless, cartoony casual game. Yet it’s surprisingly fun and addictive. First of all, there’s the farming. It’s not as complicated as other farming sims. You just hoe some soil, plant seeds, and then harvest the veggies/fruit as they become available. The plants occasionally need water and fertilizer, but watering at least can be automated with sprinklers that you can craft. Oh yeah, and you can also own chickens and a cow. 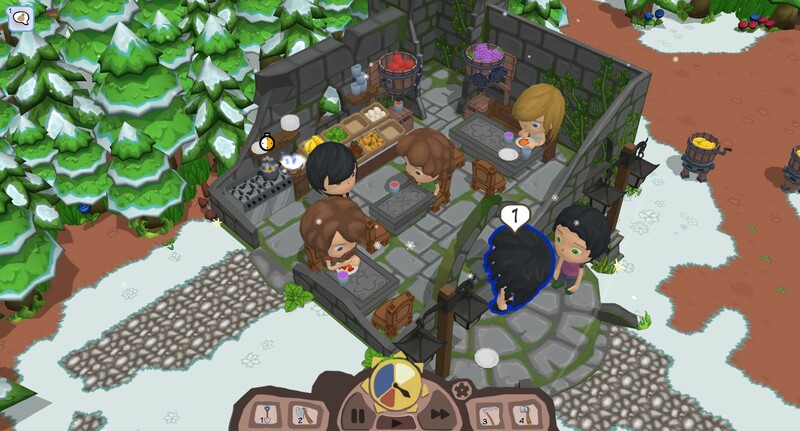 Your food is stored in your restaurant, which then can be used to cook a variety of recipes. You have to buy the recipes from the vendor first (using a bartering system) and then you have to learn them at your stove. Learning involves ninja-slicing the right ingredients over the pot as they fly through the air from all directions. The faster you slice up all of the ingredients, the less time it makes to cook the recipe. It took me an embarrassingly long time to realize that there’s a pattern to the flying fruits and I was suppose to learn it to cut things up faster. Before I thought it was just random. But you don’t just cook, you also have to take orders, squeeze juices, serve dishes, and clean up after them. It’s an amusing juggling act that means you’re rarely standing around doing nothing. 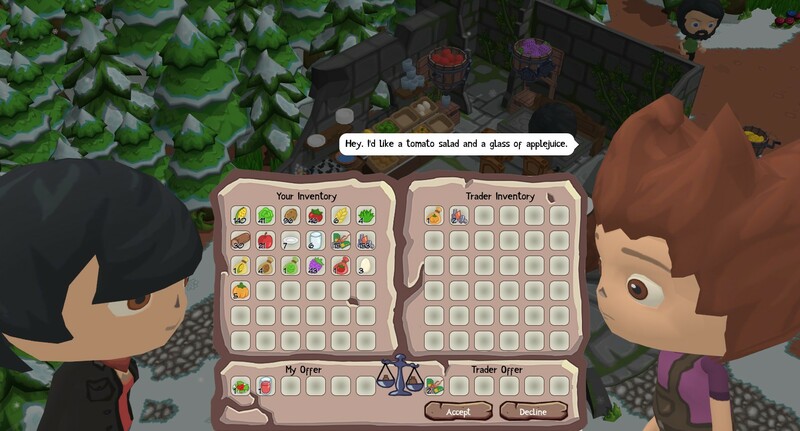 There’s also a little bit of trading strategy that you need to do, in so far that your customers will offer you random resources in exchange for the food. These include scraps and electronic parts for building machines, and plates and glass for serving more customers. Sometimes they’ll offer seeds as well but the merchant sells those too. You’re suppose to balance the scales at the bottom of the screen, but I’ve found out that if you can get their side to be just a little heavier like in the screenshot, the customer will accept it without complaint. And suddenly you’re actually making a profit off of your food. Which I like because that’s about as involved as I want to get in trading. If you had to run the restaurant and take care of the farm all by yourself, it would be absolute chaos, you’d never get anything done. Luckily, you can recruit certain survivors to help you, and you can assign them to the restaurant or the farm. So far I’ve been able to handle the restaurant on my own so my minions the survivors take care of the farm. All they ask in return is for you to cook them one meal in the morning before they’ll start working. Then there’s the nighttime tower defense. You can pick up food yourself and chuck it at the zombies (which dazes and hurts them) but it’s much more efficient to build a maze and food-turrets. If you were to have just a fence, the zombies would walk up to it and flail their arms, which eventually breaks the fence down. But if you build a maze, even a simple one, they will happily shuffle through it, not even worrying about your corn turrets or pumpkin catapults slowly picking away at their health. I usually don’t like tower defense games but this one is rather fun and simple, and once it’s set up, you can walk away and forget about it since the machines automatically fill from your food stores. If you don’t like tower defense or don’t want to deal with zombies at all, there’s an option to turn them off completely. 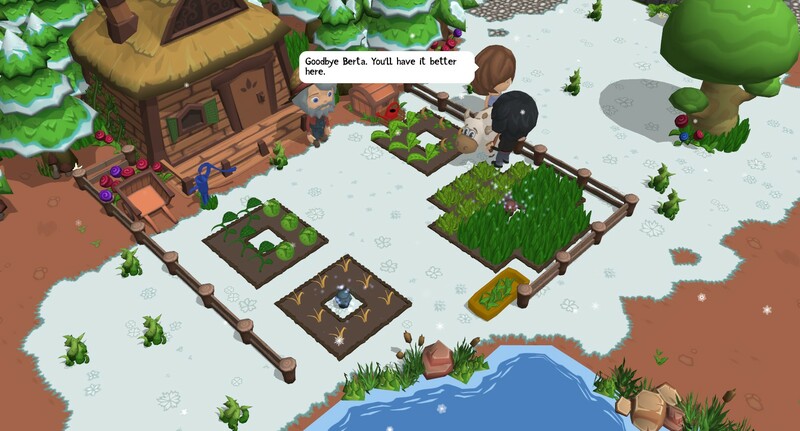 Then the game just becomes about the farm and the restaurant. For wood and stone which you’ll also need to craft things, you need to head into the woods. This is where the zombies hide during the day so you’re always going to encounter them there. You can only see a certain distance around you but luckily the zombies are pretty slow and can be easily dodged while you pick up what you need. 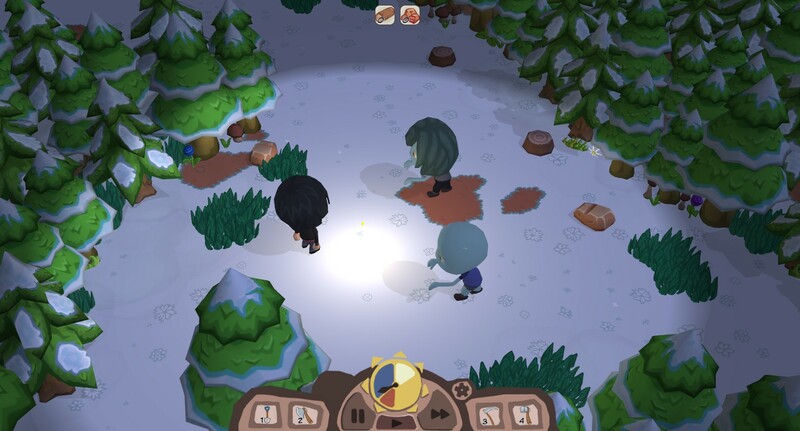 If you do get snatched by a zombie, both of you will flail your arms around like you’re in a slapping fight, and then you’ll be stunned for a few seconds and you’ll lose a good portion of the logs and rocks you’ve gathered. So there’s no bloody end for you if you mess up, but it’s definitely a good idea to not try and fight the zombies. I’ve also found that not only does time stand still in here, but every time you enter the woods, all of the rocks and stumps reset so you can run through as many times as you like. Of all of the things to do in this game though, I find this one to be the least fun. All in all, it’s a quirky casual game that’s quite fun to play, even if I do yell at customers who want recipes I haven’t bought yet. There’s both a story mode and an endless mode, with the story mode supposing to last 5-6 hours (although I’ve gotten 7 out of it so far and I’m maybe halfway done). It’s regular $10 US on Steam but GamersGate currently has it on sale for $2, so really there’s no reason not to get it. In what other game are you going to be able to hit zombies with produce?